Q: I'm trying to learn Adobe Photoshop Elements 8. Some techniques I've tried and don't like or for some reason don't want to keep. How do I say to get rid of it "just pick it up and drag it to the trashcan and release it". I can't even find the trashcan. The image is bound in the box and can't be taken out of it. Sometimes it appears to go halfway out of the box, or like behind the box, but mostly it stays in the box and cannot be removed. In any case what am I doing wrong? And where's the trashcan; do I have to click on something to make it appear? A: It can be soooo frustrating when you're trying to do something that you know should be very basic but you can't get it to work. I think once you get the hang of Photoshop Elements you will find it worth the effort you put into learning it. To answer your question, there is no trashcan in Elements to throw away your whole image. You just close the image and click Don't Save when prompted. 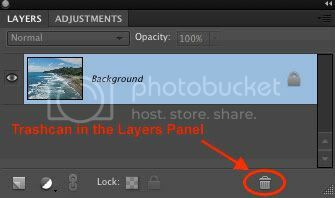 However, there is a trashcan in the Layers Panel. In Photoshop Elements 8 it's at the bottom of the Panel. In earlier versions it's at the top of the Layers Palette. in Elements, go up to the Window menu and click on Layers to make it visible. Many of my tutorials begin by having you create a new Layer. That way you can experiment all you want and everything you do will be applied to your new Layer. Meanwhile the Background Layer sits untouched by anything you do. 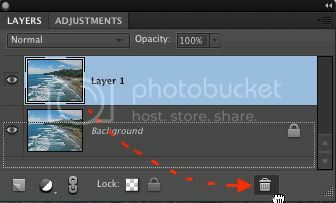 If you don't like your results you just drag the duplicate Layer to the trashcan in the Layers Panel and start fresh. 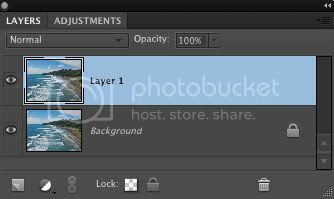 Create a duplicate Layer of the Background in the Layers Panel. The quickest way to do that is with the keyboard shortcut Control-J (Mac:Command-J). That will create an exact duplicate of the Background Layer and it will be named Layer 1. Go crazy! With Layer 1 active, experiment inside of Elements all you want. Any changes you make will be applied to Layer 1, while the Background Layer will remain in its original state. If you want to start over and try something else just drag Layer 1 to the trashcan inside the Layers Panel and then repeat Step 1. You will have a new pristine copy of the original Background to play with. I hope this solves your problem Mari. Hang in there, YOU CAN DO THIS! If you get stuck again, don't hesitate to send in another question. If you need more clarification on this procedure click on the link below to add a comment and explain what you need help with.